A panoramic view of Nelson's funeral procession in 1806. 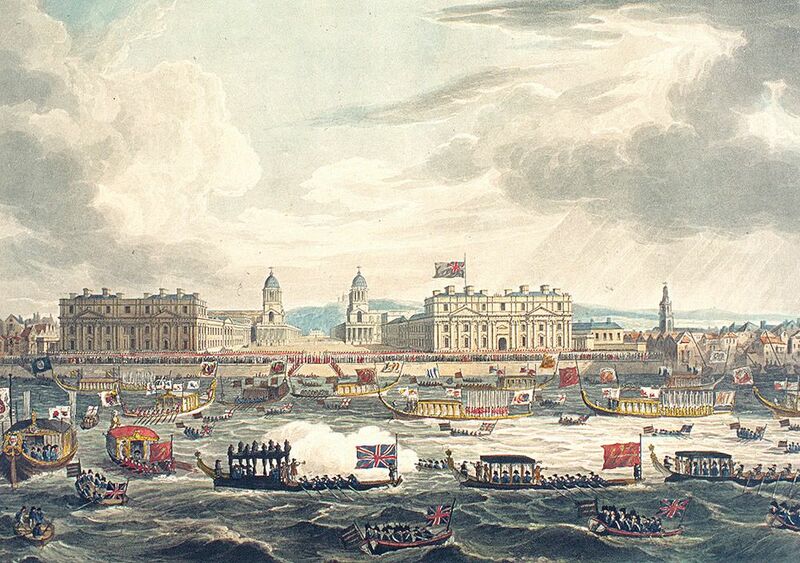 Nelson's funeral barge can be seen in the foreground on the River Thames as his coffin was rowed up to the Admirality from Greenwich on Charles II's royal barge, accompanied by over 60 boats, including a variety of Admiralty and City livery barges. In the central foreground, a barge flying the red ensign fires a salute. Greenwich Hospital is clearly visible in the background with the Royal Observatory in the distance. This Funeral Procession of the Late Lord Viscount Nelson, from Greenwich to Whitehall on the 8th January, 1806 Art Print is created using state of the art, industry leading Digital printers. The result - a stunning reproduction at an affordable price.